Duggleby Howe is one of the largest round barrows in England. On the evidence of artefacts discovered there it is believed to date to the Late Neolithic period, however no radiocarbon dates are available. The barrow is situated just to the east of the B1253 road to the south of the hamlet of Duggleby on the southern side of the Great Wold Valley in Ryedale. 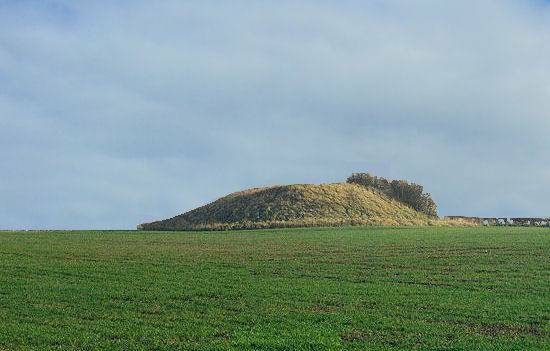 It is one of four such monuments in the area, which are known as the Great barrows of East Yorkshire. The place name Howe is thought to have derived from the Old Norse word haugr. The monument has a diameter of around 38 metres and measures over 6 metres high, its flattened top suggests that it was levelled at a later date. In the medieval era a post mill was erected on top of the mound, which may account for the levelling. The barrow stands inside a roughly circular enclosure, approximately 370 metres in diameter, formed from ditches, and open to the south. To the east of the barrow, one within the enclosure and one outside, are two ring ditches, believed to be Bronze Age in date. It was only in 1979 that the existence of the enclosure was confirmed using aerial photographs. Duggleby Howe was first excavated in either 1798 or 1799 by the Reverend Christopher Sykes, but no records of his excavation survive. In 1890 the Yorkshire archaeologist J.R. Mortimer excavated an area of 40 feet square over the centre of the barrow, and a portion of the east side. It was found to contain a deep grave pit with the remains of both adults and children. He discovered the skeleton of a man about 2.7 metres below ground level, along with a middle Neolithic bowl, two flint cores and some flint flakes. Above him he found the remains of further adult and a child along with a single skull of which the lower jaw was missing. This skull had a circular hole in it which may possibly have been the cause of the individual's death. He also uncovered the remains of a further adult along with an antler mace head, a broken arrow head a flint axe. A short distance to the east a second shallower grave was unearthed containing the remains of an adult, with arrowheads, beaver teeth, boar tusks and a bone pin. A further adult's remains was laid between the two graves along with a thin flint knife. These burials appear to have covered over by low mound of earth in which were found the bodies of a further adult, an adolescent and three children as well as evidence of cremation remains. Duggleby Howe is situated just off the B1253 road between Sledmere and Duggleby, at the south eastern edge of Duggleby village. The monument is not signposted, and there is no direct footpath to the site.